Here is a totally new French series of Cafés Grima. According to date behind the voucher opposite, it would date the beginning of the 70s. 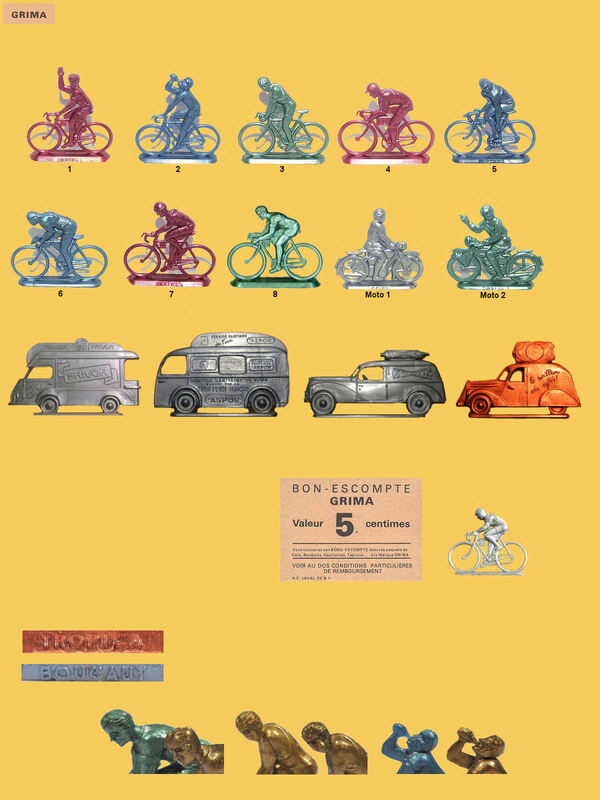 there are 8 figurines and 2 bikes. Made up is engraved on one of the sides of the base and all the subjects are plastic. Identical version of the brand Sanal, engraved on a side of the base. Thanks to Carole Lefevbre for this information and this photo. This series also exists under the brands of coffee Tropica and Boucaut added of 3 advertising vehicles and that of the sanitary service of the Tour de France. We find also in the complet of the unmarked supple versions.